Look under the hood at the classics. 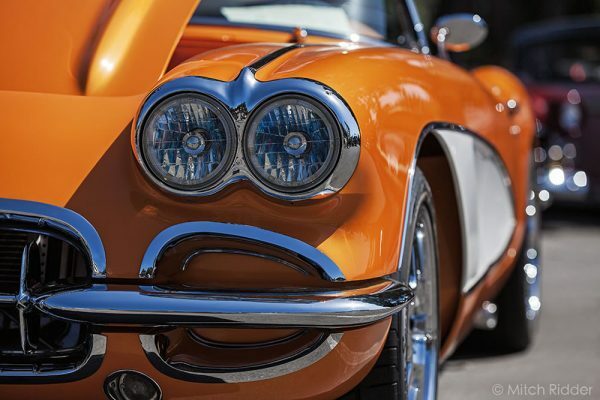 The Peoples Choice Award went to David Freedman’s 1955 Corvette. Photo by Mitch Ridder. 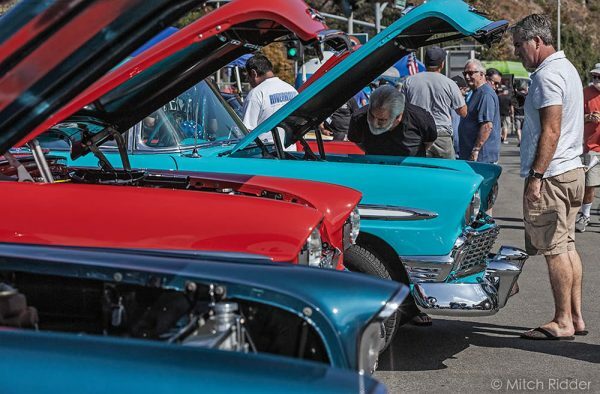 Over 800 people attended the Laguna Beach Rotary Club’s 14th annual car show last weekend to get an eyeful of 195 classic cars, the most vehicles registered in the history of the show, said organizers Harry Bithell and Laura Parisi. The entries in 24 categories ranged from woodies to muscle cars, antiques to minis. Several makes had their own category, such as Austin Healey, Jaguar, Porsche and Mustangs, but only models made before the early ‘70s were welcome. The Mayor’s Award went to Tom O’Hara and his 1934 Packard; the People’s Choice Award went to David Freedman’s 1955 Corvette; and best in show went to Dennis Grundy and his 1960 Plymouth. In addition to the classic car exhibitors, the Rotary Club show on the parking lot opposite the Festival of Arts included a burrito booth, a silent auction and food trucks. The benefit for the club’s grant program is a community wide effort. A work by local Laguna artist Michael Obermeyer served as the club poster. Sponsors and auction donors included Peppertree Lane, Pacific Life, Crevier Classic Cars LLC, The Ranch at Laguna Beach, Aliso Creek Country Club, Laguna Playhouse, I2IOptometry, European Optical, Herb Carlson, Ward Blackburn, Starfish Restaurant and President-Elect Rod Hatter.